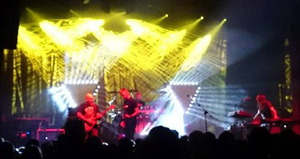 Riverside’s tour to promote their remarkable album Love, Fear and the Time Machine recently hit Bristol and they showed real class with a gloriously wide ranging set encompassing their whole career and displaying differing strands over the course of their six albums. 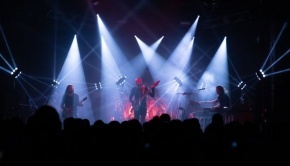 The venue was packed with a very enthusiastic and diverse crowd, ranging from younger straight rock/metal fans to more mature prog fans, who all witnessed a very entertaining and assured performance. Early in the set, perhaps appropriately for a gig played in a venue called ‘The Marble Factory’ Riverside showed real balls in immediately following the adrenalin filled rush of the metal tinged Hyperactive from Anno Domini High Definition (ADHD) with the gentle beauty of the classic piano/vocal piece Conceiving You. Their confidence in the quality of the new album was exemplified by their decision to bookend this sparkling concert with the lustrous first and last songs of their latest release. The curiously titled Lost (Why Should I be Frightened by a Hat?) gradually shimmered into life and drew in the crowd to the Riverside live experience. 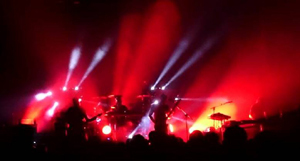 This was followed by Feel Like Falling, the first of four songs in the set from previous release Songs of New Generation Slaves, which built up the energy levels with increasing impact and heavy rock inflected tones. Even this seemed merely the curtain raiser to the immense crunching power and drive of Hyperactive, a particular favourite with the more metal loving elements of the crowd as Piotr Grudzinski’s remarkable guitar playing growled with venom and menace. However, any sense that we may be entering some sort of head banging metal mayhem was swept away by the lilting delicacy of Conceiving You, from the 2005 album Second Life Syndrome, which also underlined the extensive and rich back catalogue this band can now draw from. 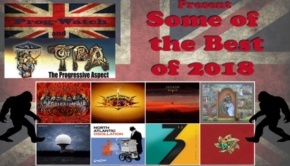 Riverside’s journey through their past continued with the popular throbbing track 02 Panic Room from this reviewer’s favourite album, Rapid Eye Movement (REM) from 2007. This was particularly popular with the sizeable and vociferous Polish contingent of the crowd. 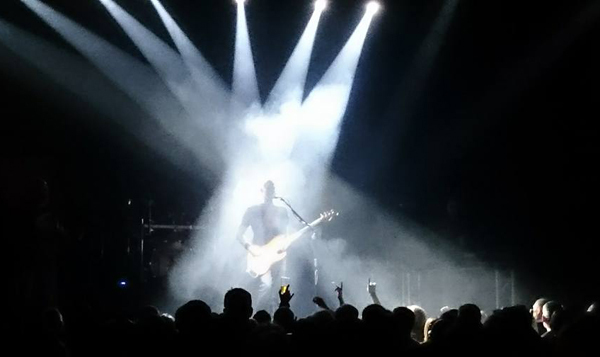 Later there was a moment in the epic finale song Escalator Shrine which combined such power, imagination and beauty when it struck me that Riverside may just be one of the finest live Progressive rock bands performing in the present day. This was a song which was dramatically improved and shone to a much greater extent in the live setting than it had on their previous album, showing that this was a band who understood that the live experience was a place in which to embellish and expand the original tracks. They let the songs breathe rather than just perform perfect but uninspired note for note carbon copies of the studio versions. The remainder of the main set consisted of songs drawn from their two most recent albums, which provided the only small disappointment for this reviewer who yearned for more songs from ADHD and REM, however any minor sense of let down was well and truly blown away by the classic song chosen for the encore… but more about that later! The sinuous Depth of Self Delusion grew even more as a live piece and was clearly in the same vein as the atmosphere of the new album. 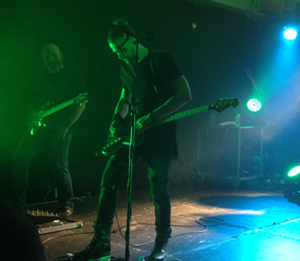 New song Saturate Me certainly ploughed an impressive musical furrow in the style of Porcupine Tree, propelled so well by Piotr Kozieradzki’s thunderous but agile drumming. Mariusz Duda is Riverside’s main songwriter and front man and he exuded coolness and control throughout the gig, playing his bass deftly, particularly on Discard Your Fear. However, it is his voice which has developed so much over the years and really left its mark. He beautifully sang with emotion and control the more subtle and challenging range needed in songs such as We Got Used to Us and Discard Your Fear. With Duda’s recent forays into more subtle, soulful and gentle music for his interesting Lunatic Soul albums it is hardly surprising that Riverside appear to be leaving behind some of their harder, more metal inflected edges, which may explain why there were only two songs from that era/style of their history. 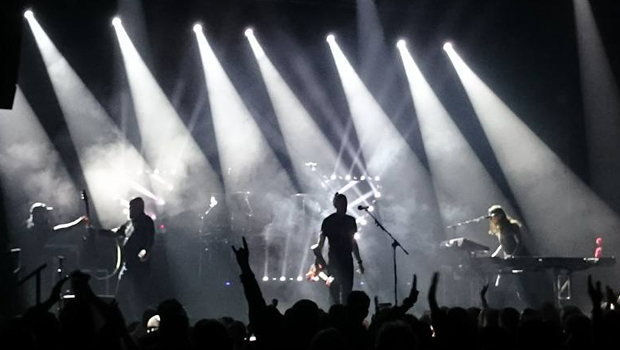 Nevertheless, be under no illusion that this is a band that has forgotten how to rock as the epic re-imagining of Escalator Shrine soars and blasts its way through the venue leaving the crowd stunned by the majesty of the performance and the impressive, atmospheric lighting. 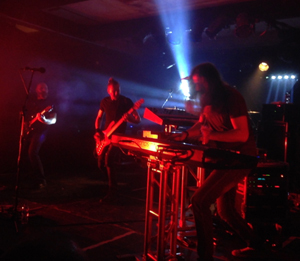 Riverside showed a refreshing willingness to not take themselves too seriously throughout the gig, including jokes about the respective appearances of their guitarist and keyboardist. 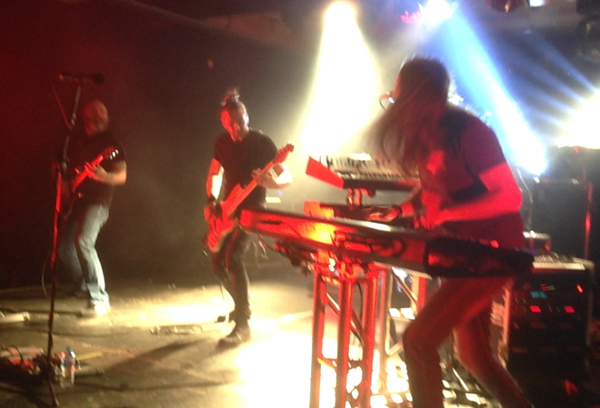 This was most exemplified by their playful and extended introduction to the first song of their encore. 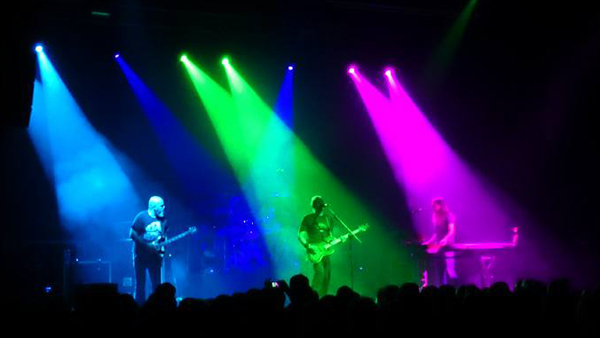 As the opening chords developed in a quite different and intentionally mischievous way it took the crowd a little time to eventually realise with great joy that Riverside were going right back to the first song on their first album, 2004’s Out of Myself, and dusting off their Pink Floyd infused epic classic The Same River. This piece particularly featured the dexterous swirling keyboard skills of Michal Lapaj. 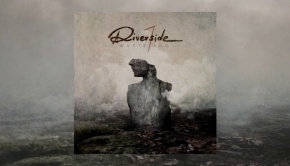 It has been quite some time since Riverside have played this hugely enjoyable number and it majestically filled the venue with a combination of sweeping melodies and powerful rhythms. Riverside were certainly flowing back to their past with emotion and skill, and taking the hearts and minds of the crowd with them on an imaginative trip. 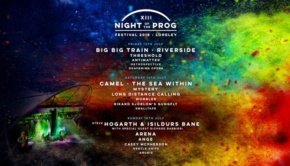 After the excitement of such a magnificent gig in which Riverside had thundered with power, seduced with delicacy and filled minds with musical colour it was time for a final gently euphoric glide into Found (The Unexpected Flaw of Searching). The crowd unashamedly waved mobile phones, singing along with the band It’s a Lovely Life. Duda brought it all to a poetic close with the line: “I Feel Like a Child, Found in Waking Life”. 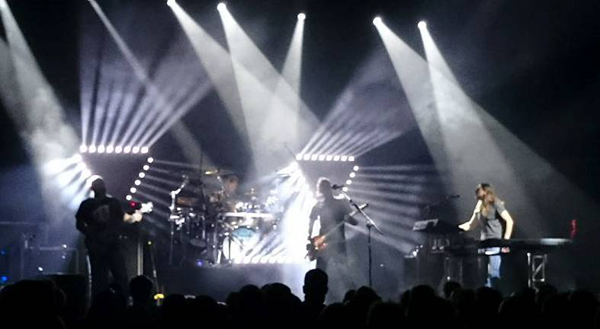 If you get the chance to see Riverside in concert it is strongly recommended that you just ‘Go with the Flow’!